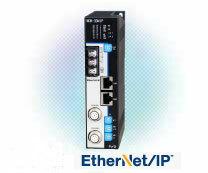 NSD’s Ethernet IP output solution is exactly what field engineer and market have been waiting for. The idea and basic configuration of NSD’s Ethernet IP come from entirely creative and different way. The physical position change and movement are detected by ABSOCODER which is the true heavy duty position sensor under the most harsh environment. Download the profile (EDS File) for EtherNet/IP from the download page (Open Network Definition File).